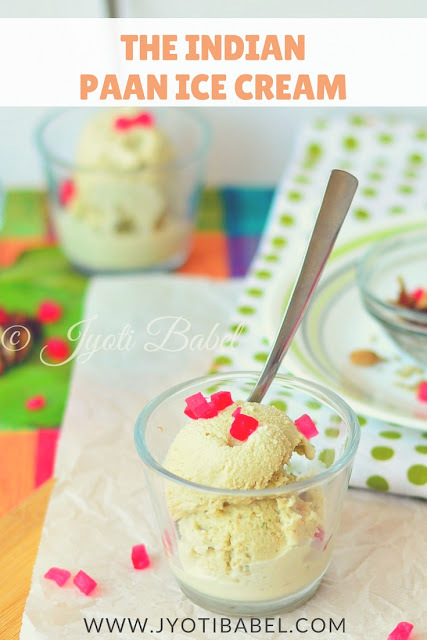 Paan Ice Cream, as the name says is an ice cream flavoured with the Indian meetha paan. This ice cream has the unique flavour of freshly ground betel leaves and an assortment of flavouring spices. 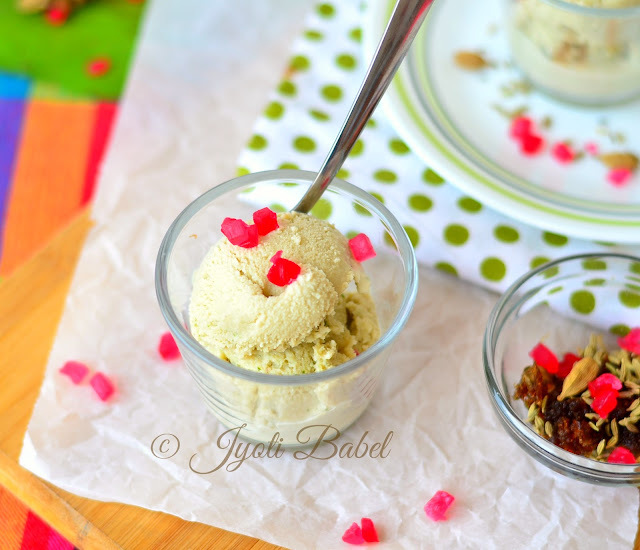 If you love Indian Meetha Paan, you are going to love this Paan Ice Cream. When it comes to cooking, the greatest satisfaction for me comes when I am able to create a flavour in a particular dish exactly the way I wanted. So, when I tasted my paan (betel leaves) flavoured ice cream, I did my little happy dance. "Meetha Paan" is one of those after-food treats I don't mind indulging in, whenever I get a chance. I remember when I was in my early teens back in my hometown, savouring on a meetha paan was a rare indulgence. But, whenever I had the chance, my special instructions to the 'paanwala bhaiya' were - extra gulkand and no supari (betel nut). The paan vendor had a tiny shop with a number of people flocking in at any point in time. Fresh paan leaves would be kept under a wet red muslin cloth, and there would be an assortment of fillings in various jars kept in a particular order to be folded inside the paan leaf, The vendor would take a fresh paan leaf, slather little 'kattha' and would ask how would you like it filled. A request for extra gulkand would often raise his eyebrow. But, in the end, everyone could have a customized meetha pan to savour on. A meetha pan is a perfect palate cleanser for me - I always put the whole of it in my mouth and my jaws are in for some extra work. Juice from the betel leaves, gulkand, fennel seeds and the various filling creates an explosion of flavours which any Indian paan loving human will vouch for. Here in Pune, we do get good meetha paan, but most of the times they are already prepared and kept in a cool ice box. When you buy one, the vendors typically dip it in rose syrup and lightly coat in desiccated coconut and serve it to you. Sometimes back when I spotted paan ice cream at a very popular ice cream joint in the city, I ordered one. But, it didn't live up to my expectations - it had less flavour of paan and more of mint flavoured mouth freshener. So, I decided to try to make paan ice cream at home. After reading various recipes online, I realized this ice-cream is very much customizable. You can flavour with a blend of things - just like the way you would want to flavour your customized meetha paan. I stuck with my fresh cream and condensed milk combination for this ice cream. Do read the notes for some extra tips. 10 medium size maghai paan leaves, divided. 1. In a small blender jar, add 5 paan leaves, gulkand, green cardamom, fennel seeds and mithi supari. Blend it to a paste using as little water as possible. Using a strainer, strain it to get the extract. 2. In a large blender jar, add the extract, rest of the 5 paan and cream. Blend until smooth. The paan leaves should be finely blended. 3. Add the milk and condensed milk to the mixture in the blender and blend again till smooth. 4. Pour into a freezer safe container and freeze for 2 hours. 5. Take out the half set ice cream and tip it into the blender jar and blend it until smooth. Freeze it again till frozen. It will take anywhere between 4 to 6 hours. 6. Take it out 5 minutes before serving. Serve scoops of it chilled. You can relish it with or without a topping. 1. I like my paan ice cream to be smooth. So, I strained the mixture of paan leaves, gulkand, green cardamom, fennel seeds and mithi supari to get an extract. If you like coarse bits of it in your ice cream, you may skip the step of straining. 2. For topping, you can use, rose syrup, tutti fruity or even tiny bit of gulkand. 3. Churning it before the final freezing if ice cream helps to reduce ice crystals in the ice cream. So, don't skip the step. You may churn it 2-3 times if you like. 4. 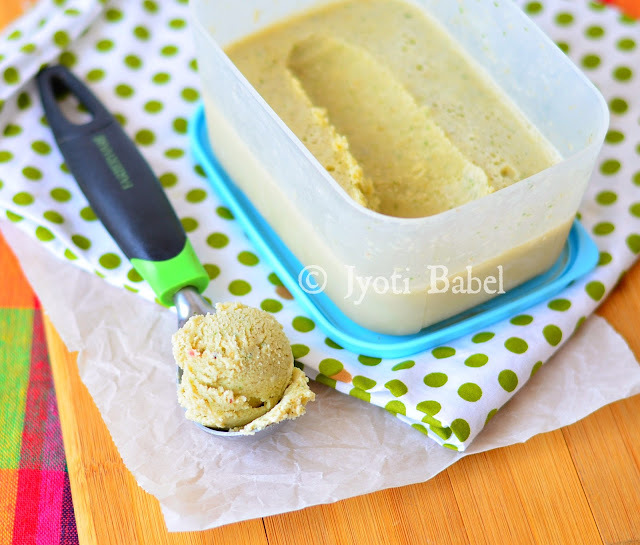 Another way of making this ice cream is - get 3-4 meetha pan from the vendor and churn it with milk, cream and condensed milk in the quantity mentioned in the recipe. Aaah anything flavoured with pan is always a welcome, lovely recipe have to try soon. Paan flavoured ice cream is simply yumm.. Cant beat the homemade ones..
Oh wow.. This is amazing. Can feel the flavour of this Ice cream.. Divine ! WOW, that is such an innovative and exotic sounding ice cream. It must have tasted absolutely amazing with that gulkand, paan leaves and spices. We are crazy with any recipes in paan. This ice-cream with feel seeds and gulkand are awe. For sure this is an hit recipe in your home.. I recently had this paan ice cream at a party, and totally loved it. I wanted to make it at home, but unfortunately I can't find paan leaves here. Yours looks absolutely yummy! A couple years back an ice cream shop introduced paan flavored ice ream and it did not taste like paan at all. Since then I've stayed away from them. However, your homemade one looks so delicious. Will have to try making it at home. Very innovative recipe. Looks delicious and love to try this soon with coconut milk. Refreshing ice cream full of flavours. LOve the serving in those cute little glass/bowl. Gosh this is super inviting and I agree that Paan icecream is the best palate cleanser. I normally cannot eat a lot of it, but do love the coolness it provides to the body thanks to the wonderful ingredients and digestive properties of the betel leaf. I also got to know from the post that you belong to Pune and enjoy your meetha pan just like me. Will try some paan during my next visit there for sure, hopefully with your recommendations. Until then, I will happily enjoy the visual delights and a lovely recipe. Wow..Ice Cream with Paan flavours! Sounds intresting as I have never tried this flavour. Lovely fusion recipe. Am screaming here, what a luscious icecream. Feel like having few scoops rite now though its super early in the morning for me. Love meetha paan but never tried making ice cream this way. Looks delish. Omg the paan icecream looks mouthwatering delicious. I wish I could eat it now. I was the lucky one to have a chance to eat this paan ice cream. such a awesome taste. In summer this paan ice cream is deliciously great to have. I tasted this recently in a restaurant here and I was totally bowled over by the flavor! m yet to make this one and have been putting it off. The kids have been asking me to make this for them during the summer hols. Beautiful clicks!